I've always liked indigo in tailoring, and find navy a good partner for it. 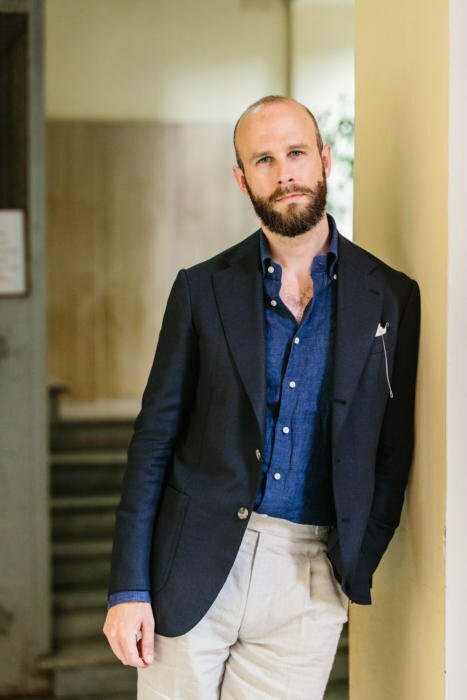 The deep indigo of this linen shirt from D'Avino, for example, is significantly quietened by the navy blazer over the top, and makes that top half a story in tonal variation. Indigo can also be hard to find good trousers for. I rarely find I like it with grey, for example, which is frustrating given how many grey trousers I own. Better usually is a pale or military shade of green (such as these Incotex chinos), or cream and naturals (pictured). Natural colours can take a little dirt and dust, and they often have natural flecks that help hide small marks. The jacket was made by Ettore de Cesare (outside whose workshop these shots were taken, up in Vomero) and was previously reviewed here. Made in Holland & Sherry mesh fabric (not actually hopsack, strictly speaking) it has proved just as versatile as I hoped. The only issue is it's a little short, and the next piece Ettore will make for me (a dark-green corduroy) will be 1-2 centimetres longer. Elsewhere here, I'm wearing Sagans from Baudoin & Lange in the bark-grey colour I worked with them on. I still find it interesting how versatile that colour is. And the hat is my sisal straw from Anderson & Sheppard. I usually reach for this rather than my Brent Black panama, even though the latter is more finely made. Unfortunately I think the shape of Brent's piece isn't quite right for my face (a little too square in the crown). These are the perils of ordering online, and perhaps a reminder that style always trumps craft (though of course we aim for both). The sunglasses are 1950s Ray-Ban Caravans in filled 12k gold-filled wire. The Caravan was the first style Ray Ban made explicitly for civilian use, having previously only produced models for sport and the military. It was their view of a clean, mid-century modern look. Originally gold-filled pairs are relatively rare, as most were melted down over the years for their gold content. Retrospecs specialises in old pieces like this - and repairs them, with mine adding gold-filled nose pads to the frame for example. Retrospecs have their own stores in LA, San Francisco and Las Vegas, and then supply around 250 opticians around the world, including 36 Opticians in London and Bergdofs in New York. I think the shape suits my face too, given it's not too wide. Which is good, as it means I haven't fallen into the same trap as the panama - ignoring style in favour of craft. They'll make a lovely accessory during Pitti this week. You can follow the discussion on Indigo, navy and natural: A summer combination by entering your email address in the box below. You will then receive an email every time a new comment is added. These will also contain a link to a page where you can stop the alerts, and remove all of your related data from the site. A well written post as usual. Regarding the pants: maybe there’s a lack of understanding on my side, but how does the versatility of cream that you mentioned and its impracticality go together? Isn’t this kind of contradictive? Hi – good point, I’m probably assuming a little too much there from previous posts. Cream is very versatile in terms of colour, in that it goes with pretty much any colour of jacket, shirt, shoe etc. It is a blank canvas from that point of view. However, it is not very practical in terms of getting dirty easily. You will end up having to wash it more than other trousers. I love seeing the caravan model here. Its one of those models that seems to have taken a back seat compared to aviators, wayfarer and clubmaster. Although these ones are really making my standard gold model look poor by comparison. I am also really glad the Bark Grey colour is proving versatile on the Sagans – mine arrive tomorrow. The jacket appears to have slightly roped shoulders, whereas you normally avoid these for more casual outfits I think? Was this purely to stick to the offered house style or a change in direction? You could reduce the level of formality by swapping the buttons for e.g. a greyish mother of pearl. Their mesh is a great summer fabric. On the sunnies, if you were in Naples you should be sporting Persol!! Simon, can you recommend an online shop that sells good-quality buttons? I’m looking for an upgrade to my navy jacket buttons – preferably matte brown horn or mother-of-pearl. I recall you mentioning the Button Queen, is that a shop you’d still recommend? It’s a vintage shop that closed down unfortunately. 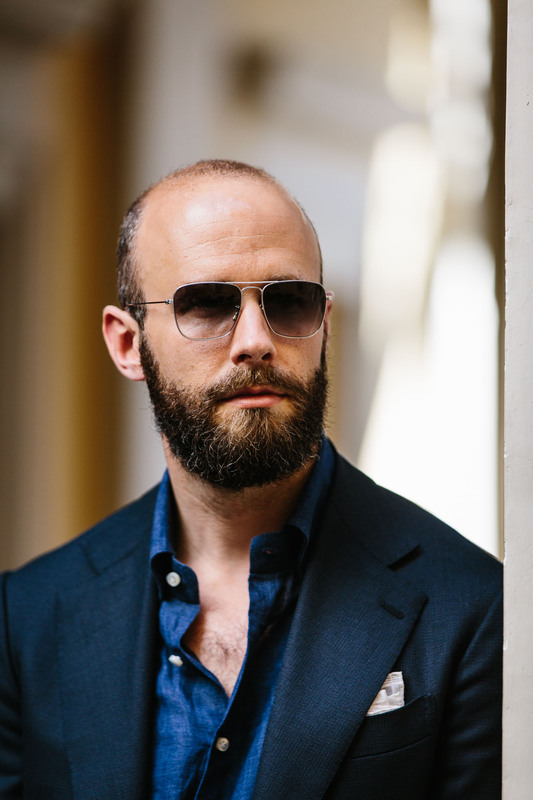 Persol are from Agordo in northern Italy – a long way from Naples, both geographically and culturally. I see a tad wrinkling in the arms of the mesh SC. Best to cut it a tad longer to account for it? Also, do you have the code? Thanks! Great fan here, but you really are getting more and more of a Pitti man! Style always trumps craft… the old SC would have never said such a thing! Interesting. I think I would have said even at the start that fit was the most important thing, not craft. Indeed I wrote that pretty obsessively – and fit is what we’re talking about here in terms of the line and size of a hat, for example. However, what I have also come to realise in recent years is that you need style as well as craft and fit – and that this is where so many bespoke artisans fall down. No matter how well made the product, or how perfect the fit, it also needs to suit you and your environment, and look good. We don’t write about that too much because so many other places talk about style and never mention craft, but the style requirement is always there. I find one looks far better in a Tom Ford windsor jacket than most bespoke customers do. Are the most acclaimed bespoke tailors not those with a strong sense of Style (Cifo, Sexton, Huntsmann,…)? And I would not dare to say that their craft is bad. I think I should have phrased that better. I meant, rather, that you can look good in something that has style but no craft. You cannot look good in something that has craft but no style. Your comment about Tom Ford seems to suggest you think style is more important though? Sorry, It is my english: from your reply, we seem to agree on the importance of style. The names you mentioned make good classics, but I like classics with a touch of magic/drama, therefore my wardrobe would ifeally be designed by TF, Cifo,…(both for jacket/suits, definitely not for shoes). Ok the , Simon, here’s one for you. Interesting …. I always thought the battle was style v fashion but your response suggests style v fit is also a fight of consideration . When Simon interprets Gonzague’s praise of Tom Ford to mean style over craft, I remember Sator and others at Cutter & Tailor who severely criticize Ford’s tailoring. I had a sport jacket made by Vergallo in the same mesh fabric. It’s great for warmer weather. Honestly I don’t like the colour combo of the navy jacket + indigo shirt. I don’t know how does it look like on natural light, but on the photos, the two shades of blue clash with each other. I would either look for a much closer shade of blue. Or I will check if any shade of tan, tobacco, or brown would suit this indigo shirt. It would be challenging for sure. Apart from that, the weave and patch pockets are not enough to bring the jacket on the same formality level as the shirt. This jacket is still very formal from a distance of a couple of meters. A fabric with some natural irregularities like linen, shantung, or dupioni would have been in my opinion a better choice for combinations with this shirt. I usually like the combos you do. This is one very seldom case where I honestly don’t think that the colours and fabrics fit each other. “I would either look for a much closer shade of blue.” Really?! Strange! Hristo, you would look for a much closer shade of blue? Why monotone? By the way, Simon’s shade of indigo is clearly different from navy blue – the difference is pleasing? Obviously this is a matter of taste and this is subjective. For me there are 2 main ways to combine 2 colours – you either go for colours that are very similar or you go for high contrast. As the indigo shirt is dark, it is very difficult to achieve a nice contrast by going darker. Dark blue, or dark grey, or dark brown – to me they all look wrong and clashing with such shirt. So you are left with either a monochrome upper part of the body or you have to look for a lighter or more vivid jacket which would create a very peacocky look. As a matter of fact maybe the best way to combine this indigo shirt is to wear it without a jacket on a hot summer day. I would agree with you. Summer is for light colors. This ensemble is too dark for the season. I can’t really comment Sebastian, I’ve never tried them. This is a nice outfit! I wonder why the length of the blazer still bothers you. Frankly, for … a Summer navy blazer, it’s fairly fine. A sober remark about cream trousers. Where does the pocket square come from? 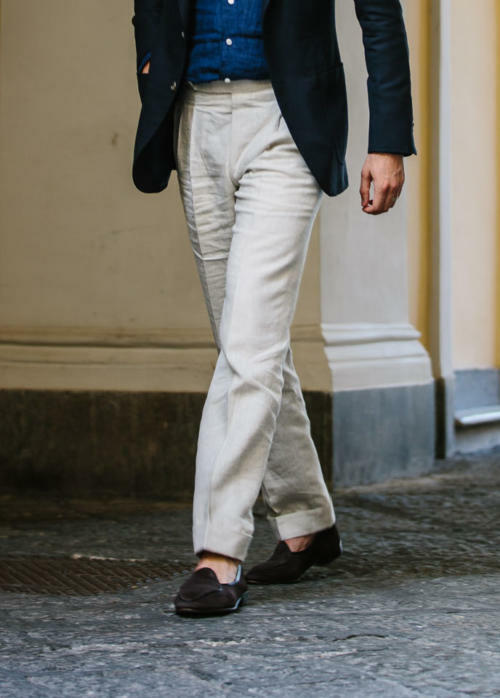 These trousers seem to be linen and you’re wearing a linen shirt. Yet another exception to your recommendation not to wear a linen top when you’re wearing linen trousers? No, that was about jackets and trousers. Do you rate each of those? I know another well known hatter fairly publicly slates Lock. Being a 64-65 hat size unfortunately I don’t have many choices. They’re all pretty similar. Decent quality and you’re paying a bit more for the location. Lock a bit more again for the name. Interesting. I like the colour combo Simon.. I would have gone for a mid blue but the indigo is better. There is also a mild sleight of hand in the matching; as one comment points out the jacket seems too formal for the ensemble but it works as the natural linen trousers are cut so well and therefore retain good clean shape (despite the characteristics of linen). Re. the Button Queen ; whilst the London shop is closed the business now operates online and is based in Wales. Following your mention in an article I visited the shop and bought a few items. It was a real find – a pity it has gone but I hope the business may last in its new guise. Do you judge cream colour as impractical because it shows any soiling? If an indigo shirt clashes with gray trousers, do you include light gray? Would that outfit work with jeans? Excellent colour combination and one I often sport myself. In warm weather it’s perfect in cities for both day and dinner. OK, the jacket is a little short but it is marginal and as you say it is something you can fix next time. In terms of colour matching an indigo linen shirts. I also find that they go with a light tobacco colour. I have an A&S work jacket in heavy linen in this colour and they go perfectly. Not keen at all on the shades Simon. I don’t think they are the correct shape for your face and look to be too narrow. I also think you need a more substantive frame to balance the outfit. 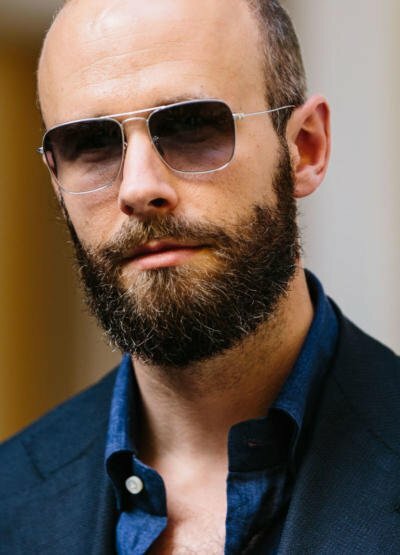 Try a Cutler & Gross 128. They might work for you. It’s a good looking outfit for me. Yes, you could go for a paler blue shirt (still in linen), as you could a pink or even a white, but I see nothing wrong with this at all. I always think a tortoise frame looks better on sunglasses than metal, but it’s a very personal thing. I’ve got a pair with a yellowish frame and bluish lens, which would sit perfectly. Most of my acquaintances hate white trousers. Besides the impracticality point raised here, I don’t get it. I think they add so much more vivacity to an outfit—like the one here—compared with other light shades. Maybe it’s because I’ve never seen Miami Vice. Thoughts on a white replacement here, Simon? I know you’ve endorsed it with light suede in the past. White can be nice, but it’s not very sartorial or smart – normally cream is better there. How do you transport your hat when traveling – in a box? The glasses work very well with your face. Adding the beard takes it to the moon. 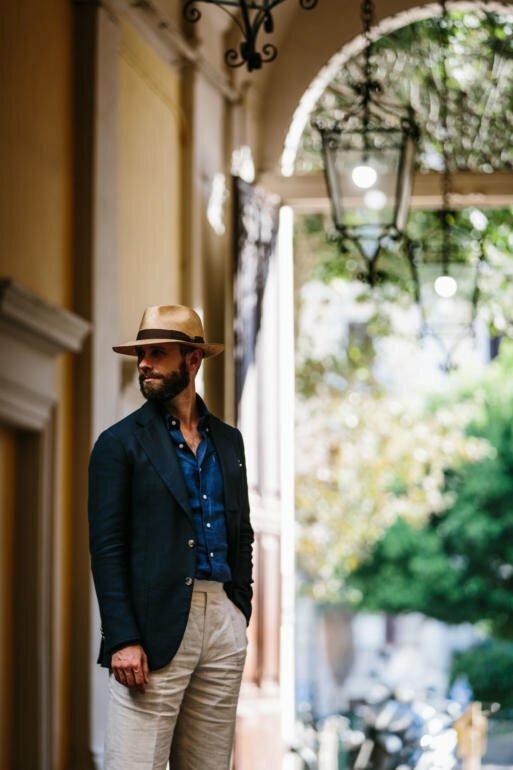 When pairing cream/tan/natural trousers with a navy jacket how should you vary the shade of trouser with the the shade/depth of navy in the Jacket? When the Jacket is a lighter navy should the trousers be lighter beige/tan or darker with a more yellow/khaki cast? Dear Simon, would you mind telling us what number of the H&S mesh blazer bunch is the cloth your jacket is made from? Thank you! Thank you, Simon! This is the name of the bunch, since there are more then just one navy and several blue swatches, I was wondering if you could possibly share the code of a specific fabric your jacket is made from. Is it 307004? I’m sorry for bothering you. Thank you, that would be lovely. I’m concidering ordering a jacket from this material and would be curious to know about your choice. Dear Simon, may I ask you if you had a chance to ask H&S about the code? Thank you! Thank you Simon. I love the color tone of your Every Day Denim. However, I asked you before – it’s something too thick for HK hot and humid weather. Right? My closet has gradually become more and more indigo and navy recently, and I saw some olive green canvas Palladium shoes I really love, but am not sure if they would go with most of what I have now (not dress clothes. Very workwear/casual. I have my black wingtips for my suits). Would it look good or horribly clash? Which Neapolitan tailor is best value for money and consistency? I’m visiting in the summer and would like to get a pattern with a tailor I can count on to produce suits and jackets straight to finish for future orders. I think they’re pretty similar – you wouldn’t wear either with navy or denim trousers.